FlossieBlossoms: I just can't have anything nice anymore! 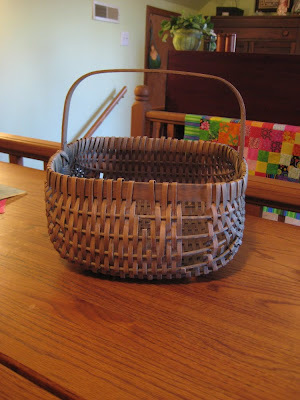 About 25 years ago, my husband gave me the coolest birthday present- basket weaving lessons. I loved them, learned all the basics and all about different supplies and then I bought some books and branched out on my own. This basket was the hardest one I ever made. I had to mold the spokes to the handles and then let them dry in order to form the nice round, square shape. I think it's called a Margaret Basket, but I'm not positive anymore. It looked great, I dyed it green after it was all done and it served us well for over 20 years until some big doofus stuck his big fat foot thru it! It was partially my fault, I left it on the floor and it was dark. I knew it was there, but I guess he didn't. It still worked, the holes were mostly on the sides, but it was bothering me and he felt awful about it. So I fixed it! I had a lot of twill tape in stock so I wove that thru the bad spots and voila! It's better. Not perfect, but better. And the poor thing is very brittle. Hopefully I bought it a few more years of gentle use. Because our old dog is having a few problems and needs to wear a "bikini" with Poise pads in them, we have to keep the pads real handy. 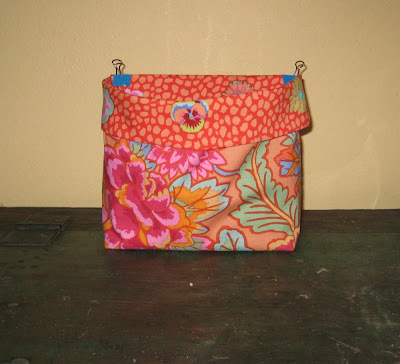 I got tired of them being out in plain sight all the time, so I broke into my Fassett materials and made this. 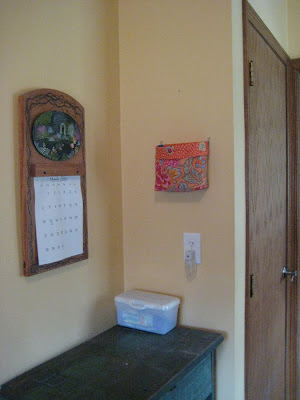 It holds both size pads that we use and hangs on the wall, up out of the way. 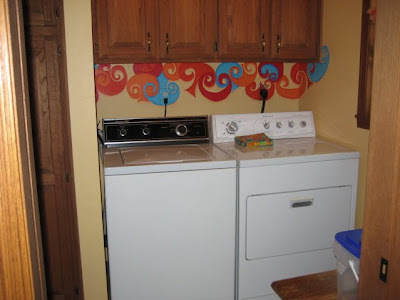 And it goes well with the wall color and other things in the room. A simple project, but quite needed and rewarding. 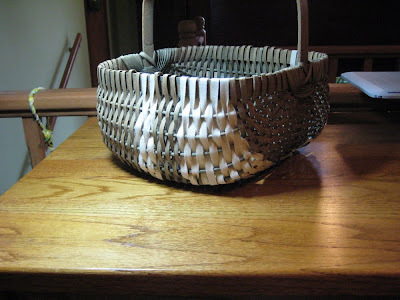 I love the basket even more now it is repaired as it has individual character. Bit like someone with a streak of white in his hair (my son springs to mind..:-) I think you are mighty clever making a basket like that in the first place! I tried once and believe you me... it's nothing like yours... more full of holes and wonky! Love the Kaffe. Can't beat a good Kaffe fabric and looks lovely there. Next you should try under water basket weaving. Oh, I must be feeling better. Hope the pup is on the mend and good for you selling in the shop! They like you they really really like you. I do. What a fun blog you have! 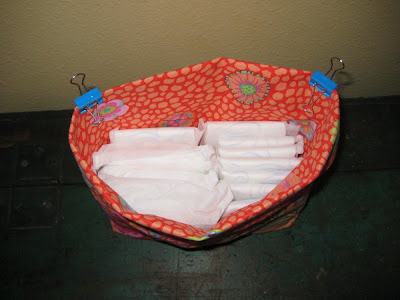 Great job on fixing the basket. Hope it puts you in the mood to weave some more. I enjoyed seeing your quilts as my mother is a quilter. Hi Susan, I came over for a look after you were nominated on Lara's blog for an award. How bout a pic of the dog in the bikini, sounds hilarious (thoug we know old age is not). The cats digging out the catnip had me cracking up. Our cat is so old and placid, I don't think he's ever had catnip. Maybe he's deprived?